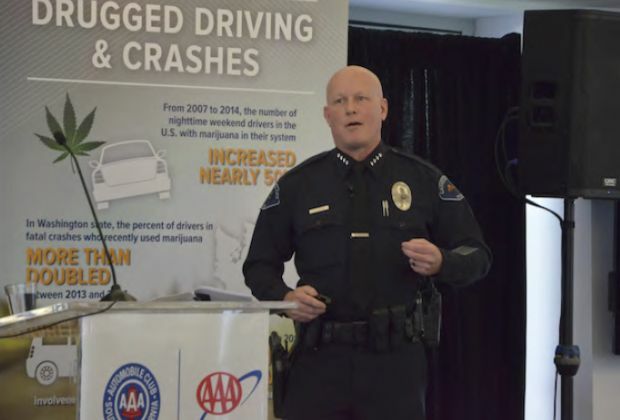 Cathedral City Police Chief George Crum, a lead Drug Recognition Expert instructor, spoke at a recent Impaired Driving Summit hosted by the Auto Club. Now that California voters have approved Proposition 64 to legalize recreational, non-medical, marijuana use in the state, the Automobile Club of Southern California is urging policymakers, law enforcement, and other safety groups, as well as interests that supported and opposed the measure, to quickly move forward with education, law enforcement training, data collection, and research efforts to address impaired driving. Adopt marijuana impaired-driving laws that are enforceable based on current scientifically recognized methods to determine drug impairment. It’s not currently possible to correlate the blood content of active-THC, the impairing ingredient in marijuana, with driver impairment or crash risk in the same way we can with alcohol. Without that capability, an effective marijuana impaired-driving law must require both an observational assessment by a specially trained law enforcement officer to confirm drug impairment along with a positive blood test for any amount of active-THC. Prepare law enforcement to better identify marijuana-impaired drivers by increasing the number of Drug Recognition Experts (DRE) and Advanced Roadside Impaired Driving Enforcement (ARIDE)-trained officers. Strengthen California’s state data collection capabilities related to marijuana-involved impaired driving. Increase public education efforts to emphasize that while recreational marijuana use is now legal, marijuana-impaired driving is not.